Filmed in August 2014 on a six day river trip with Western River Expeditions, this project actually started almost 10 years ago when 360 Labs cofounder Thomas Hayden was on a months long road trip across North America for the project that would become Google StreetView. His assignment was to drive the streets of a city with his company camera car, capturing 360º images up and down the city streets, then move on to the next city. When his team finished Denver, they were assigned to shoot Phoenix and, like every good American driving through the southwest, they visited the Grand Canyon. Standing in nearly the same place on the south rim of the Grand Canyon as Ellsworth and Emery Kolb had done more than a century before, with their new-fangled “moving picture” camera, Hayden said to himself, “We’ve got to get StreetView down there!” The Kolb brothers were using the brand new technologies of 1912 to share their Colorado River adventures with the world; enlightening folks on the grandeur of the canyon, and especially the rare views from the bottom, looking up. Their black and white footage, shot before Charlie Chaplin had ever produced his first silent movie in 1914, captivated tourists for decades afterward in their studio that still clings to the cliffs high on the south rim of the Grand Canyon. Emery Kolb boasted it as the longest running film in history. [Thomas Hayden poses with his camera]. 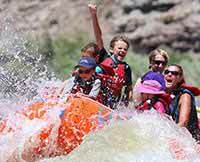 Western River Expeditions had engaged another 360º photographer in the Denver area, named Daniel Holton, to take the technology on a river trip to shoot very high resolution 360º photographs for a Grand Canyon virtual tour. Daniel and Thomas were both among the first Google Trusted Photographers in the country together, as part of the Google Maps Business View program. Daniel knew that Thomas’ 360 Labs was also working with 360º video, and the invitation to join the river trip was offered. 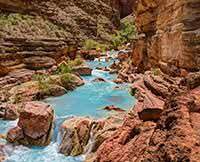 The team behind Google Maps had recently taken the current and powerful StreetView camera down the Colorado River and published all 225 miles of the Grand Canyon in 360º photographs. This is another amazing way to explore the Grand Canyon online, but Hayden didn’t feel that 360º still images captured the energy of whitewater rapids and weren’t going to be terribly helpful to future boaters, who needed to see how the water moves through a rapid to learn how to run it successfully. When the invitation came to go down the river with Western, Hayden and his support team at 360 Labs jumped at the opportunity. [Daniel Holton in the Grand Canyon]. Holton and Hayden arrived at Lee’s Ferry with dozens of cameras and specialized rigging for shooting in 360º. Wide angle lenses and panoramic tripod mounts as well as their standard photography kits. Holton’s mission was to shoot 360º photographs while the party was on land, and Hayden’s mission was to shoot 360º video while on the river over the six day trip. For the 360º video, Hayden had 20 GoPro cameras and 90 batteries for them, knowing that solar recharging on the scale he might need would not be reliable so deep in the Inner Gorge. Various camera mounting positions on board Western’s J-Rig boats were experimented with, but Hayden and the Western guides settled on a center mast position high over the boat for the clearest view of the river features as well as maintaining anonymity for the Western guests onboard. 360 Labs recorded over 100 named rapids through the Grand Canyon in 360º on the 2014 trip, and will be using the footage for a variety of projects and products. Their next project will be a VR documentary about the proposed development at the Little Colorado Confluence. “We want to show that VR is much, much more than just cool.” Hayden said of the documentary project, which 360 Labs will be posting on Kickstarter soon. “VR 360º video is, right now, the next best thing to actually being there, and anyone who sees this place, as it is, can’t help but want to protect it.” He is hoping that because influential people in a wide variety of fields will be seeing VR for the first time, that he can inspire them to spread a conservation message. “We think VR can save the Grand Canyon by spreading awareness of what could be lost by development at the confluence of the Little Colorado River.” Western is proud to be part of this effort to raise awareness.